I fought tears as they threw their hands in the air and began to describe cats they loved because the cats loved them, and dogs who ran to the door to meet them the minute they got home from school. There in front of their middle school peers, completely unabashed, they spoke lovingly in childlike voices about their pets. I’m pretty lucky in my line of work to witness miracles every day, big and small. I get to see totally wigged out, triggered boys go from sobbing to absolute joy when they get in the presence of their horse. I witness kids tough as boot leather turn to mush as their horse relaxes under their caress. Without speaking, the animals in their lives are teaching them to trust, to have empathy, to love unconditionally. Kids who have no reason to trust, and in fact every reason NOT to trust, have no problem putting their faith in a 1000 pound prey animal. They understand the prey instinct that the horse has, and they honor it and care for it. They’ve been the prey, in ways I can’t describe to you here. But, I don’t have to explain much; the horse says everything for me. When their moms, by not showing up night after night, say they’re unlovable, the horse accepts them unconditionally. When their teachers say they’re deadbeats, trouble, unfocused…the horse sees right through that to their mindfulness. The horse asks for their leadership, and they come through for their horses every time. Anxiety is traded for calm. 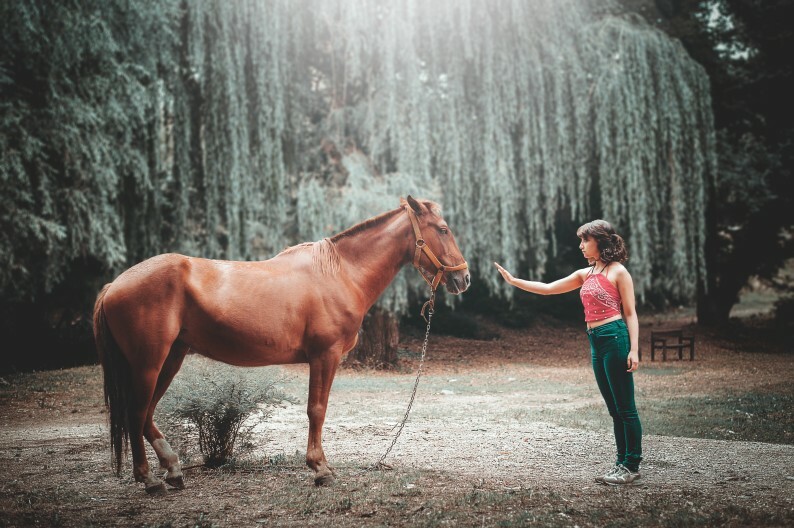 And bless those horses – they take all of that negative energy out to the pasture, eat their feelings for the rest of the afternoon, and then forget about it, eager to connect with the kid the next time. Horses are countering the negative forces in their lives, turning the tide on their trauma histories and giving them a reason to see the world anew, and to see themselves through the eyes of a horse. And that, folks, is the power of the horse. My only problem is that now I have 16 middle-schoolers that want to live with me at work. And if I know you, you are about to take all 16 of them home with you!!! Love you honey! Love your heart! You’re a beautiful person, with a beautiful heart. You’re creating miracles that these students will be able to reflect back on later in life. How cool is it to be someone that can demonstrate to a hurting soul, that life is hard, but we don’t have to be alone. Thank you! I’m so glad you’re back with us!! Love working with you. I love that horses eat their feelings. Makes me feel so much better as I do the same. It’s all gotta go somewhere. Thank you for the work you do. The world is a better place – what a delightful, thought provoking post. Sending hugs. Thank you for taking the time to read! I do love my job. Love this and your heart. Miss you friend!